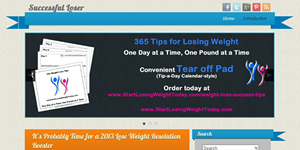 SuccessfulLoser.com is a traditional blog site that works with my weight loss website, StartLosingWeightToday.com. Through this blog I can quickly write about my recent experiences, weight loss news, products, and more that will automatically be posted on social media sites like FaceBook and Twitter. My readers and followers can easily comment and share with their friends.